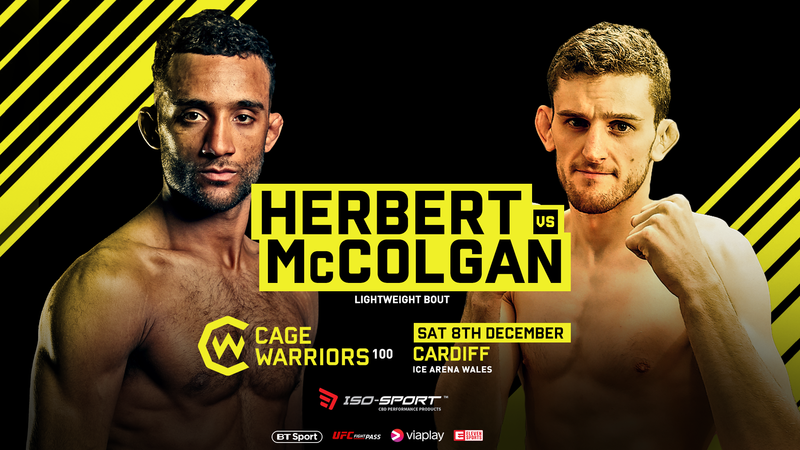 With just over a month left until the biggest event in the promotion’s history, Cage Warriors have announced Jai Herbert v Joe McColgan, Scott Malone v Josh Reed and Håkon Foss v Aaron Khalid for CW100 on December 8th. Just last week, Cage Warriors president Graham Boylan announced in a tweet that his December 8th card has grown even bigger and better than expected, and that CW100 will be one for the history books. In the first of a new batch of fights to be announced, Jai Herbert takes on Joe ‘The SBG Hunter’ McColgan in the lightweight division, pitting two of Europe’s finest strikers against each other. With Herbert, who fights at Team Renegade under UFC veteran Tom Breese, due to fight at CW98 earlier in the month but forced off the card due to injury, he’s raring to get back under Cage Warriors lights. He’ll face a stern test in McColgan, whose last fight with Sean Carter at CW86 was one of the very best striking wars we saw in 2017. Also just confirmed is a bantamweight match up between Scott Malone and Welsh fan favourite Josh Reed. Malone is fresh off a huge TKO victory against Adam Aramasinghe at CW98, and is ready to spoil the Cardiff party with another finish to close off the year. Home country hero Reed will have other ideas, and with 6 of his 7 wins coming within the distance, fans have come to expect nothing less than absolute fireworks when he steps in the cage. Reed’s teammate, Jack Shore, will headline CW100 in a bantamweight title fight with Mike Ekundayo – two unbeaten prospects at the top of their game. In the Welterweight division, Sweden’s Håkon Foss takes on Aaron Khalid, another Welshman looking to secure the home victory on December 8th. Both men took less than a round to finish their last opponents, and are looking to climb the incredibly stacked Cage Warriors welterweight roster toward the title currently held by Ross Houston. CW100 takes place at the Cardiff Ice Arena on December 8th. As well as CW100’s huge main event between Shore and Ekundayo, already confirmed on the card is a featherweight title fight between Aiden Lee and Dean Trueman, and a massive welterweight war between UFC veteran Nicolas Dalby and Ireland’s Phil Mulpeter. And more fights to be announced.